Vintage Coolers featured here are considered to be classic Americana – made during the boom era in the US when gas was cheap and advertising found its way into everyday life. 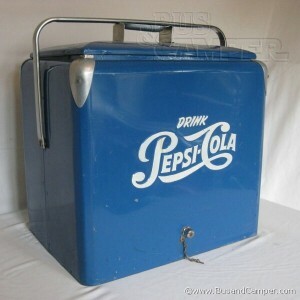 Of the most notable manufacturers were Progress Refrigerator Company based in Louisville Kentucky USA. 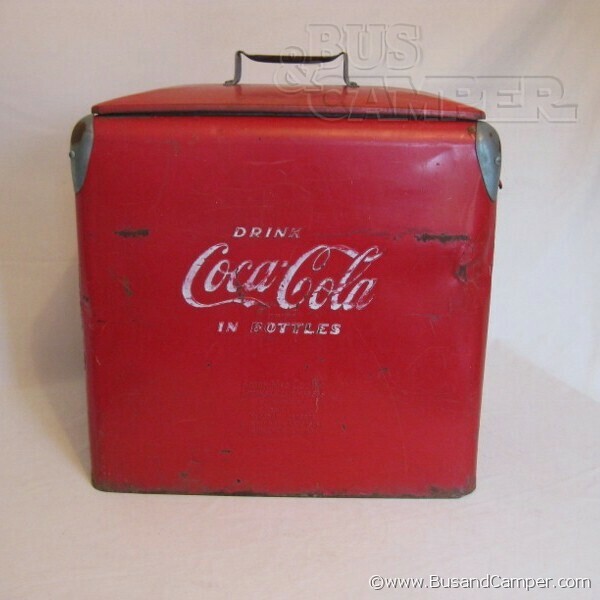 Progress made several variations of a core design and then wrapped the galvanised and insulated inside with different embossed steel outers bearing the advertising of various drinks companies of the time. Each brand in the time fought to have an identity – either in slogan or colour. For example Coke or Coca Cola were red, Pepsi were blue, Dr Pepper were light green, 7up were white, Royal Crown yellow, Squirt yellow, Royal Crown yellow etc. Each A1 style cooler had a clever handle mechanism that not only folded out of the way but in the upright position also locked the lid onto the body it provided a very convenient way of carrying the cooler. Not heavy at about 11 Kg these coolboxes were of exceptional build quality and are now copied – their design was so unique at the time – an icon of Americana. Other features are the drain tap to allow the ice water to drain away – accessible from the outside of the cooler – no need to tip the whole thing on its side. Finally a bottle opener for those metal topped soda bottles that your vintage cooler has been carefully carrying around is provided on the outside of the cooler. 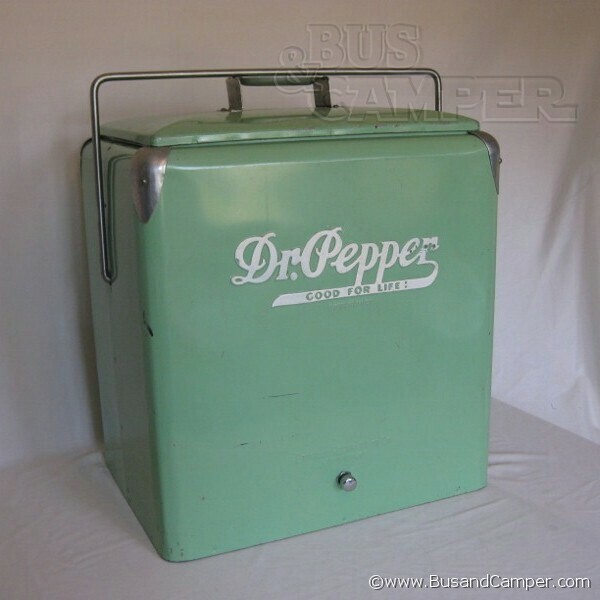 Clearly these coolers are old, made during the 40′s and 50′s they have to stand the test of time. The steel outer casing is the first sign as to how well they have been cared for – often rusting and in the more worse examples there may be rust holes. On the other hand the galvanised liner is not as prone to rust so is normally found intact. The lid usually has dents from heavy items sitting on the top probably from all those years of being stored in an attic or a basement all those years. 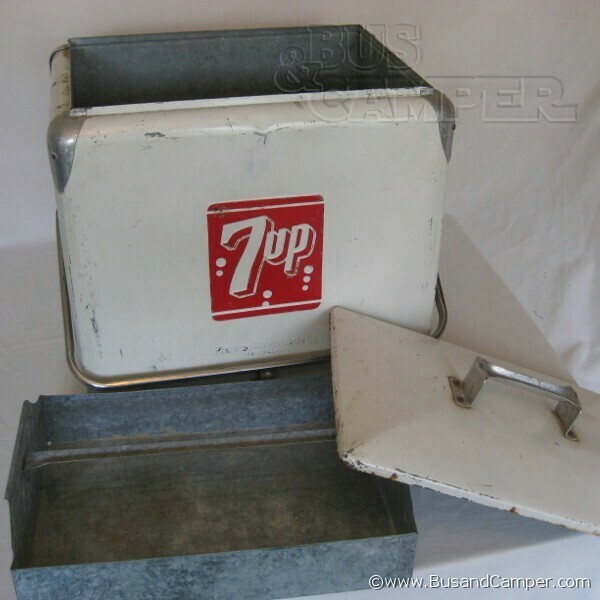 The sandwich tray or ice tray is often missing – a sign of use maybe but there were many different designs over the years – from trays with handles built in to trays that just rested on the top ledge – however, all were galvanised sheet steel that was folded tightly to fit the cooler. Finally look out for the drain tap – some are just rusted out – there are replacements available however in the US. 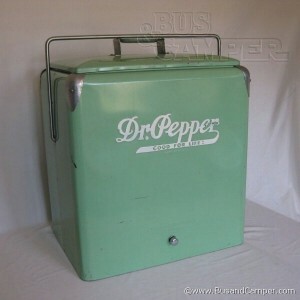 More coolers featured and for sale in our Vintage Cooler Shop.